KwaZulu-Natal police are investigating a case of arson after a mosque was allegedly petrol bombed on Monday, 25 February in Effingham, Durban North. Greenwood Park SAPS communications officer, Sergeant Vincent Mthembu said the caretaker was sleeping in the Faizane Mariam Mosque when he was disturbed by a noise early in the morning. Police said a group of suspects threw what appears to be a petrol bomb through the window setting the mosque alight. “He managed to escape through the window. He noticed the prayer room of the mosque was extremely damaged. “At the moment, the suspects are unknown and its suspected that petrol was poured through the window,” said Mthembu. 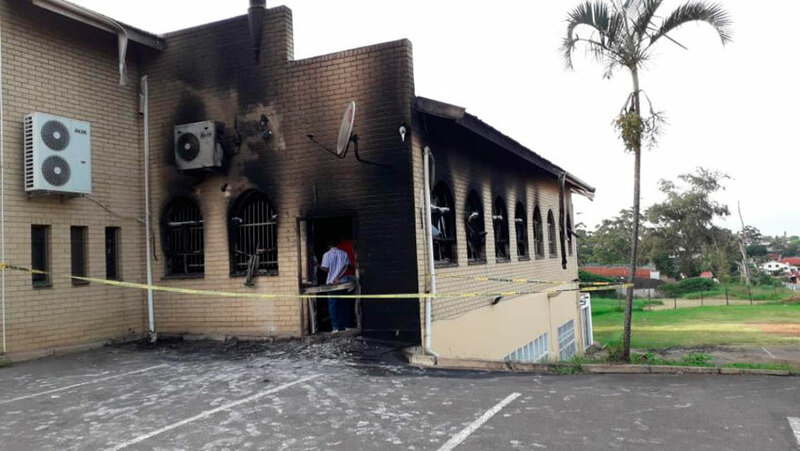 Secretary general at Jamiatul Ulama KZN, Moulana Rafiek Mahomed commented,” The Muslim community of South Africa has received with shock and anguish the news of an alleged arson attack on the Masjid in Durban. “The Masjid has sustained heavy damages due to the fire. “To date, no confirmation has been received from authorities as to the cause of the fire. “A Masjid is a place of worship and is sanctified ground for Muslims. “Places of worship are respected by all peace-loving individuals and should be places of safety and security. “We call on law enforcement agencies to take swift action in investigating this matter and restoring calm to the Effingham community. The Effingham Islamic Society Trust has dismissed reports that the incident is linked to religious differences between Sunni and Shia Muslims. Last year the Imam Hussain Mosque, one of three Shia mosques in the country, was the target of attacks which claimed the life of bystander Abbas Essop and led to the discovery of a bomb plot. Effingham Islamic Society trustee, Imraan Subrathie has denied those allegations. Subrathie said,” We don’t know who could have done it, but this arson attack has absolutely nothing to do with that. “Devastated worshipers began arriving at the mosque. Many could not hold back tears. “The ladies section is damaged. We are devastated. “The damage would cost about R1.5m to repair and we only have R7,000.